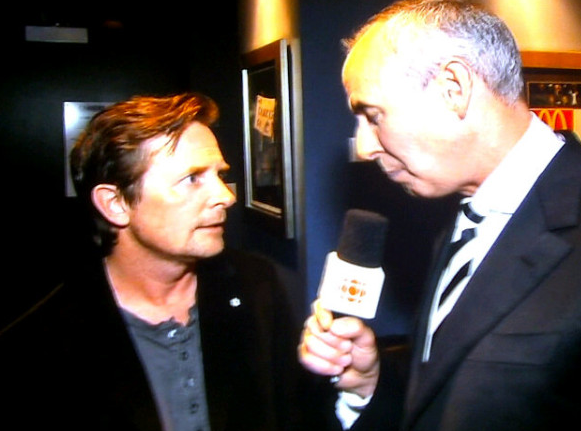 XOXO Jes - Canadian Entertainment News: Michael J Fox...Bruins or Canucks? Michael J Fox...Bruins or Canucks? When Michael J Fox's face flashed on the jumbo-tron tonight at Rogers Arena in Vancouver the crowd went wild. MJF is a Canadian who grew up in Burnaby, BC...but word on the street is that he is a fan of the Boston Bruins. Burn. When being interviewed he said he was cheering for both teams...and in case you don't understand that it is code for "I am a Bruins fan, but I don't want to get beat up on the streets of Vancouver." Don't worry Vancouver...you have plenty other Canadian celebs who are cheering for the Canucks to win the cup. They are not Order of Canada inductees, but I guess you can't win them all. The Green Men spoke to the Boston Globe while holding a cardboard cut out of their latest victim...Bostonian, Ben Affleck. You know who else is from Boston...Mark Wahlberg. Just saying...I may have to side with my husband's city on this one hockey fans. I am really surprised and annoyed every time I hear the Green Men say they can't afford to get to games (or infer that they won't be able to make it)...isn't Vancouver full of loaded Canucks fans? Will they not support the only Vancouver fans that I don't hate. Come on people. Get it together. Vancouver won game 1 of the series....19 seconds to go in the game and they score. 1-0. Game over. The Bruins won the Cup. Game over! !